An easy one this time because I love the colour in this photo! I also love the look of Ailsa’a pizza,check it out here http://wheresmybackpack.com/2012/07/13/food/ and join in with this weeks theme. Ooh Gilly, how wonderful! It’s so vibrant, the colours just pop out at you. Delicious. 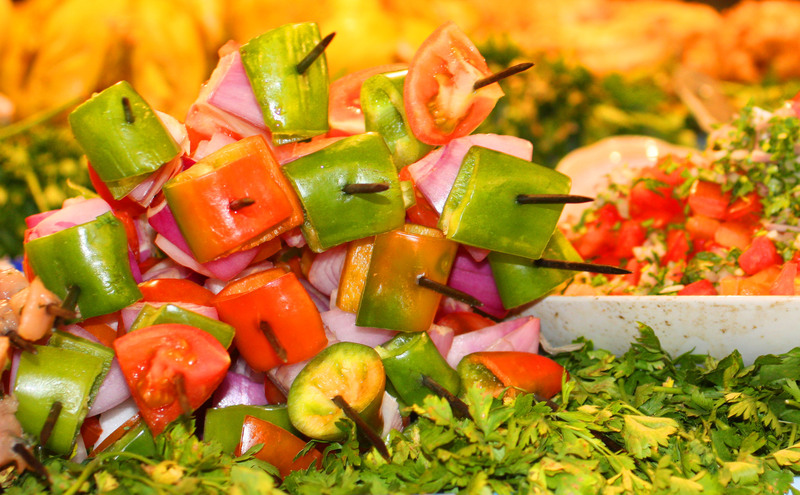 Veggie skewers in the food market in the main square – Djemaa el Fna in Marrakesh. This photo was taken by my Mum, when three of us were on a fantastic long weekend away! Very colorful and looks healthy. I’m so hungry now. Delicious post!!! I love the colors! Healthy pick! Well that does it Gilly…I am coming to your house for a meal when I am over your way. Oh yes I am !!!!!!!!!!!!! The perfect dinner menu for me. I’ll be right over. So delicious and so yummy.